Selling a new product is not an easy game. You have to create interest, give customers more than just an item to consume, but a story, a cachet, an idea. That's what these two companies are trying to do. Recently at Zester Daily, I wrote about Societé Orignal. 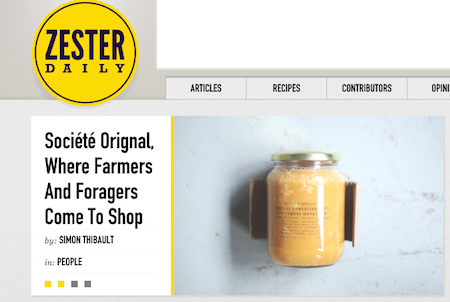 It's a Montreal-based online retailer that specialises in high-end foodstuffs that speak not only to the consumers culinary sense of taste, but heritage as well. On a more local note, Nova Scotia's own Haskapa is the little company that could, with its award-winning haskap juice garnering more and more local and international attention. Not bad for a product that is just barely beginning to get onto shelves. The article I wrote for The Globe and Mail is not available on their website, but I'm sure you'll be hearing more about them soon. And on a more personal and seasonal note, I also wrote a pice for The Coast about that most-warming of winter endeavours: turing on an oven, and leaving food to slowly braise, warming both the home and the belly.